Here's a wonderful poster from Overleaf themselves! Just click the poster to go straight to the challenge page! The winners of our Campus Challenge 2016 will be the universities that earn the most ducks during the challenge, as shown on the Challenge Leaderboard. The 1st place winning institution will win free Overleaf Pro accounts for one year for everyone at the institution. The 2nd place winning institution will win free Overleaf Pro accounts for six months for everyone at the institution. The top ranking schools in each region will win free Overleaf Pro Accounts for six months for all Challenge participants. Have at least 80% of members of your department sign up for the Campus Challenge and your whole department will receive a free six months of Overleaf Pro for all students, faculty and staff! This challenge requires someone with access to a full and up-to-date list of department members, let faculty know! 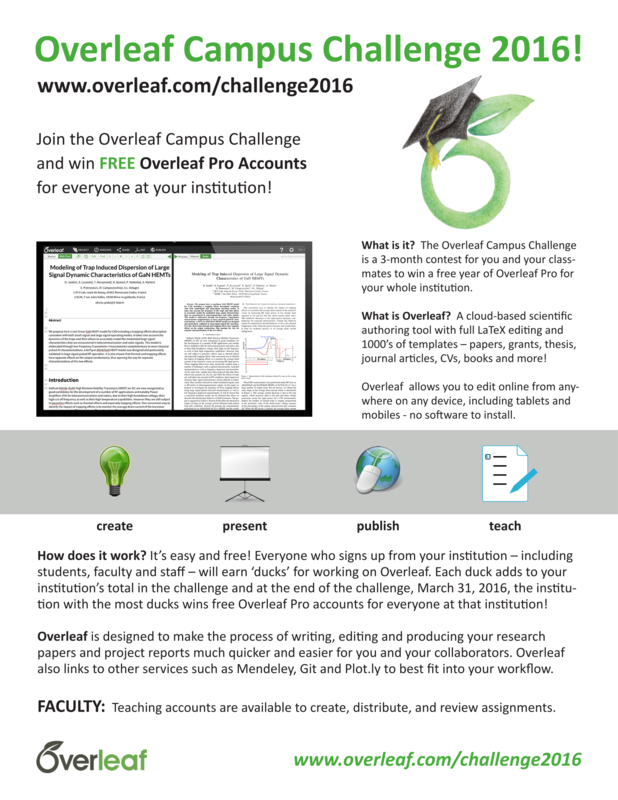 Promote the Campus Challenge on your institutional blog or website and we’ll send you some Overleaf ducks! Yep – we’ll send you a set of your very own Overleaf ducks to name, share or talk to for debugging. At the time of writing, my university (Aberystwyth) is placed 465th in the global leaderboard and 221nd in Europe. We want to win some ducks!